Cavities are never fun. Few people look forward to having a filling placed, but thankfully you can repair your smile with small, tooth-colored fillings. We invite you to explore a few of the ways tooth decay is managed and treated at Gallery Dental. What if it were possible to identify cavities before they were visible on x-rays? 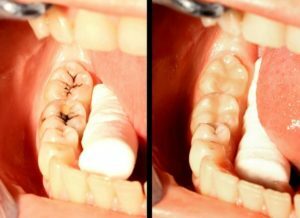 Can you imagine having a way to diagnose tooth decay inside of the enamel while it is still very small and easy to treat? Dr. Sekhon uses transillumination techniques to do just that. The use of a bright light helps him identify suspicious spots within the tooth. By finding cavities inside of your enamel in their early stages of development, we can prevent the cavity from spreading and causing more harm to your tooth. It’s one of the ways we offer minimally invasive dentistry. Many people come to us to have mercury fillings removed from their mouth. Mercury is an ingredient used inside of amalgam (silver) fillings, and some research has suggested that it could be related to conditions that impact the central nervous system. We can provide you with printed material during your visit with us so that you can make an educated choice about your method of care. Our dental lasers allow us to treat cavities using minimally-invasive, needle free equipment, which is how most of the fillings on our pediatric patients are completed. Do you suspect that you may have a cavity or two in need of treatment? Visit our practice here at Gallery Dental to get acquainted with Dr. Sekhon and his dental team. We welcome new patients! Give us a call today to schedule your personalized consultation. We also provide dental implants. All treatment is provided by a general dentist. For more complex cases, we often refer our patients to a specialist for treatment.